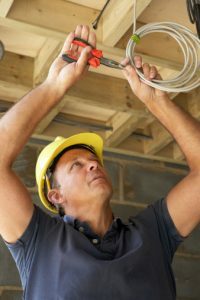 If you’re a business owner looking for experienced, dependable Gloucester Township commercial electrical contractors, D.P. Murt Co., Inc. should be your destination. We offer comprehensive electrical and wiring systems to industries and commercial entities throughout South Jersey. Our company is veteran-owned and has been serving clients for over 30 years now, and businesses choose us for our reputation of projects finished on time and on budget. Commercial Service. Whether your facility is a restaurant, shopping center, apartment complex or any commercial residence, D.P. Murt can replace the decaying wiring system with a state of the art, code-approved new system. We also handle all of your design and build electrical needs, from upgrading lighting systems to installing new generators and HVAC systems as needed. Industrial Service. From everything to maintaining power wiring systems to installing or repairing generators, our team of experienced, professional technicians can keep your plant running and prevent devastating shutdowns. We can handle your security needs too, from upgrading your fire system to installing electronic door readers, to keep your workers safe and prevent potential theft. Institutional Service. We stay ahead of the technology curve and can improve or replace your existing power supply system with a more energy-efficient, cleaner supply. D.P. Murt can install new green energy systems using wind and solar power that can cut your energy costs. You can find out more about how we keep your power supply safe and efficient by clicking on the Services tabs on this site. Whatever your electrical and power supply needs, D.P. Murt is ready to complete the job at a fair price. Click here for a free survey and to meet with our team, and to learn more about what sets us apart as Gloucester Township commercial electrical contractors. We’ll take care of the power, so you can take care of the business.